In the last few weeks I’ve been so super busy getting the design finished for the printed The Lotus and the Artichoke vegan cookbook, I’ve hardly had any time to get new recipes up on the website. The good news is: The cookbook is going to print this week, and I’ve got another time-tested favorite recipe inspired from my travels. This one is also in the cookbook, and it’s just too good not to share! Along with the pineapple pancakes I recently posted, today’s dish has always been one of my favorite culinary memories of Thailand. I ate Vegetable Pad Thai at the street carts, at nice restaurants, in back alley neighborhood restaurants, and at the simple beach resort on Koh Chang. All over Bangkok you can get street food Pad Thai a dozen different ways. I always got the vegetarian stuff, which usually had tofu and vegetables, but sometimes just vegetables. For about thirty to fifty cents I’d get a steaming bowl of noodles and veg topped with sauce, crushed peanuts, and a lime slice or two. I usually dosed it with some more hot sauce and then sat down on the sidewalk somewhere to chow down. I’ve had some amazing Pad Thai at restaurants in other parts of the world, too. The Boston Chinatown Eatery, which I’m told no longer exists, had some incredible Pad Thai Pak. (I also used to love their Thai Eggplant Basil!) Sadly, convincingly authentic Thai food is difficult to find here in Berlin. There are a few places I go to infrequently, but I usually find it more satisfying to make this dish at home. It’s a great small dinner party meal, and if you’re just cooking for 1 or 2, you can always save the leftovers for lunch the next day. I’m constantly surprised by the number of Veg Pad Thai recipes online without any trace of tamarind sauce or paste. Years ago, when I was still living in Boston, I figured out that tamarind is like the secret ingredient to a good Pad Thai sauce. It seems to be in most store-bought Pad Thai sauce. Yes, you can get away with substituting a teaspoon of tomato paste (did I really just write that?) but you’ve really got to have fresh lime juice and decent soy sauce. Invest in a decent bottle of soy sauce – the dark or “superior” cheap stuff available at Asian markets everywhere has such a strong taste it overpowers all the delicious, more subtle flavors of anything except quick fried rice. Soak rice noodles according to package: Usually they need to be soaked in cold water 10 min. Press tofu: Wrap in kitchen towel, apply weight 20-30 min to remove extra moisture. Cut in cubes, triangles, or crumble. Mix all Pad Thai sauce ingredients in a bowl or glass. Heat oil in large pot or wok on medium high heat. Add garlic, shallot, ginger, chili. Fry 2-3 min. Add broccoli, carrots, baby corn, tofu. Fry until browned, stirring regularly, 7 min. Drain noodles. Add to vegetables in large pot, mix well. Add Pad Thai sauce. Mix well, fry stirring constantly, 4-5 min. Remove from heat. Cover, let steam, 5 min. Plate, garnish with peanuts, sprouts, and fresh coriander. Serve with lime slices. Simple Pad Thai: omit broccoli, carrot, baby corn. Make and add only 1/2 to 2/3 amount of Pad Thai sauce. Vedic Indian fusion (No garlic or onions): substitute 1 tsp ground coriander, 1 tsp black mustard seeds, 1/8 tsp hing for garlic and scallions. Fry with ginger and chili. Creamy Pad Thai: Use 1/3 cup / 80 ml coconut milk instead of water and cornstarch for Pad Thai sauce. Cooked sprouts: Add the sprouts with noodles and lightly steam instead of using for garnish. Crispier Fried Tofu: deep fry or pan fry tofu cubes or triangles separately, add fried tofu to vegetables along with noodles at end. 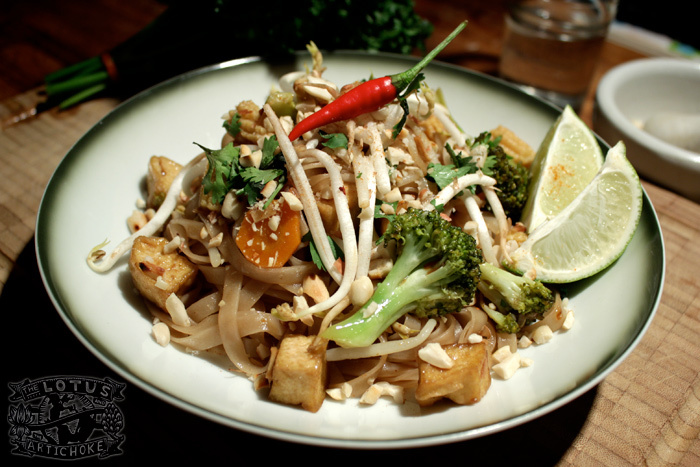 This entry was posted in Street Food, Thai and tagged pad thai pak, recipe, Thai, tofu, vegan, vegetable pad thai. Bookmark the permalink. Du hast nicht zufällig ein veganes Som Tam-Rezept? :).